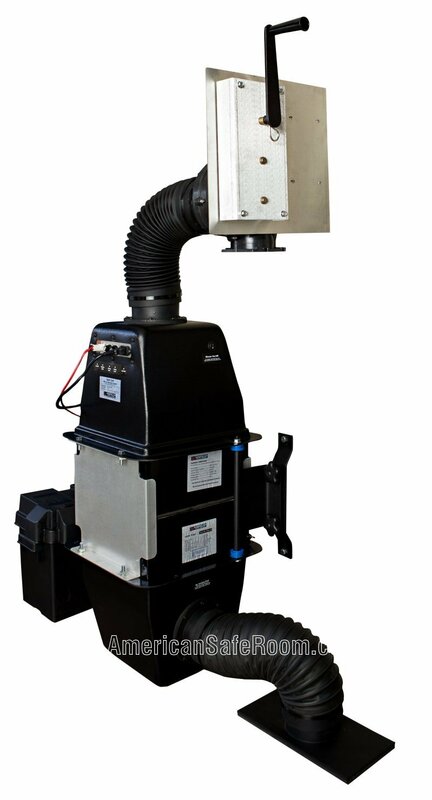 The only Nuclear, Biological, and Chemical air filtration system with a manual battery backup system. If the grid drops out, it takes just seconds to switch the cord to the battery! Shown here are the 60 CFM Safe Cell, a backup hand crank, two blast valves (one for the intake and one for the outflow), an overpressure valve, an automatic ventilation blower. 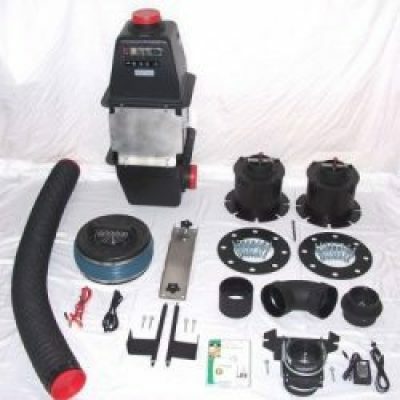 Also shown are some user supplied items: the deep cycle battery, a length of 4 inch, schedule 40 ABS plastic pipe with optional pipe clamps, and an extra length of hose on the top of the pipe. 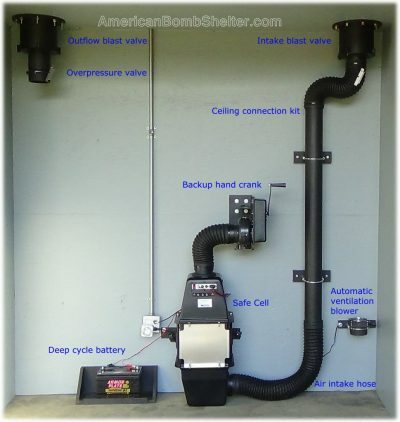 Everything you need to turn your underground shelter into a blast protected collective protection safe room. We even throw in free UPS Ground shipping with complete systems! The two blast valves mount over the intake and outflow penetration pipes with the included concrete wedge anchors and heavy duty gasket. Once they are in place, the Safe Cell and the automatic ventilation blower are mounted where the flexible air intake hose can reach them both. This hose can be slipped right onto the intake blast valve, or plastic pipe can be used to plumb down from a ceiling mounted blast valve – as shown in the picture above. That’s it for the intake. On the outflow, the overpressure valve is slipped onto the outflow blast valve. That’s it. Everything goes together with nuts and bolts. Easy installation! 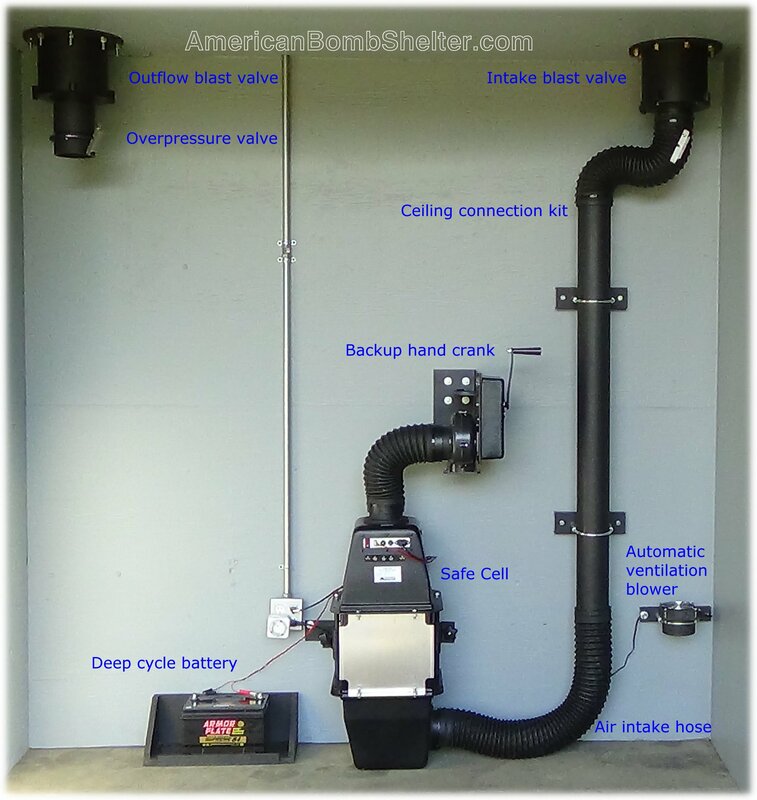 One AC and DC capable Safe Cell with a complete filter bank, includes a pre-filter set, a nuclear grade HEPA particulate filter, & warfare gas carbon adsorber. One wall mount bracket, 2 quick release clamps, 2 star nuts & 4 lag screws. One 120 volt AC to 12 volt DC power supply. One emergency hand pump or an emergency hand crank. Two blast valves with gaskets (one for intake and one for outflow), concrete wedge anchors, and a masonry drill bit. One overpressure valve with both wall and ceiling adapters. 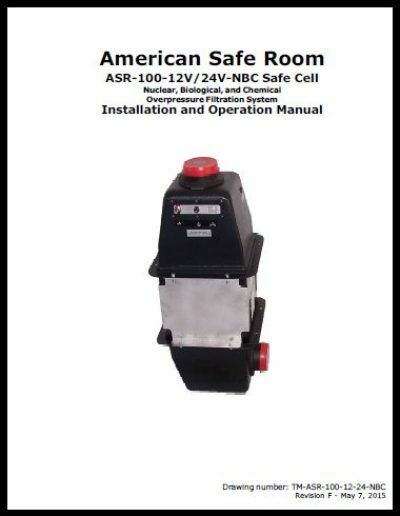 One hard copy of all of the installation and operation manuals. The complete system comes in five boxes and is priced at hundreds less than the sum of the individual items! Flat rate UPS Ground shipping is GREATLY REDUCED. The average shipping cost we pay UPS to deliver one of these systems is over $300.